While January shows us new beginnings, hopes and aspirations to achieve our goals, December every year gives us a reality check. It’s more like our report card. Boom we enter the reality and the results are very often a humble amalgamation of our efforts and luck. Yes, luck! .And just when we talk about luck is when astrology comes in. Somethings could have been better and some a wild escape. Well, as we are about to enter the Year 2018 let’s make sure what we should and what we shouldn’t be doing. What are the little secrets of making our lady and luck dance to our tunes? What brings our Men and Magic right on time? And finally, how do we make our report card look like the way it has never been before? Yes, that is exactly what your stars tell you to do. The focus should be on point. Carelessness should be completely avoided. Check, recheck and recheck once again before you submit anything. Sign any documents if needed very carefully. Expect the unexpected but in a good way. Yes, you can expect some miracles your way. While all the good things are happening don’t forget to be grateful to friends and family who supported you throughout. Your Success Mantra For 2018: The repetitive emotions and physical feelings you get to bring to you some very important insights.They are your answers, make sure to see the unseen, and hear the unheard. The clue might just be around the corner. This year you will be a year of endings and beginnings for you. Ending with difficulties and those unhealthy relationships that don’t do good to you in any way. You will exactly know what should be done, just gather the courage and take the plunge. All the changes you have faced has made you a better person full of compassion. Your Success Mantra For 2018: Don’t compromise. You deserve the best. It’s your positivity that has brought you this far. Don’t forget to hold positive thoughts for yourself and you will set the LOA( law of attraction)in motion. Also Read: How Successful Can Your Zodiac Sign Be At Work? This year you shall discover how situations and people settle in your favour just by the very power of your faith in them. Most of your legal matters settle in your favour this year bringing in happiness and profits. Leadership role suddenly comes to the forefront. You might assume some powerful position or get appointed to a position where you are required to lead and show your skills. You discover a new side of yourself this year and you like it too. Your Success Mantra For 2018: Show the people around you that you have complete faith in them and see how they work to bring the best results to you. Doubting anyone around can be poisonous for the relationship, professional or personal. This year is going to be a year of endings and beginnings. Where one chapter closes the other one shall begin to bloom and you will soon notice the inklings to it. A Lot of your relationships and health-related issues shall be healed. Better conditions at work and understanding with colleagues bring harmony at work front. This year will give you enough power to forgive and forget your past and move into the newness of 2018. Along with new beginnings, you get a chance to review your plans and make corrections where needed. This means you might get a second chance for a particular situation. Not everyone gets to avail such opportunity. Make the most of it. Your Success Mantra For 2018: Release the patterns and habits that you think no longer serve you for your highest good. This year is a year where all the Leos are requested to take it slow. Rather I would say take one step at a time. This isn’t a very good time to take any long-term decisions or make any long-term plans. You need to dig in, do more research, get your hands on some important information, be sure of almost everything before you take the plunge both into your personal and professional life. So this year slow and steady mantra works for you. Also, you need to understand that everything happens in its Divine Order. So don’t try to push or force things. Everything will happen and is happening at its scheduled time. Your Success Mantra For 2018: Go with the flow. Take it easy. After all, it isn’t the end of the world. 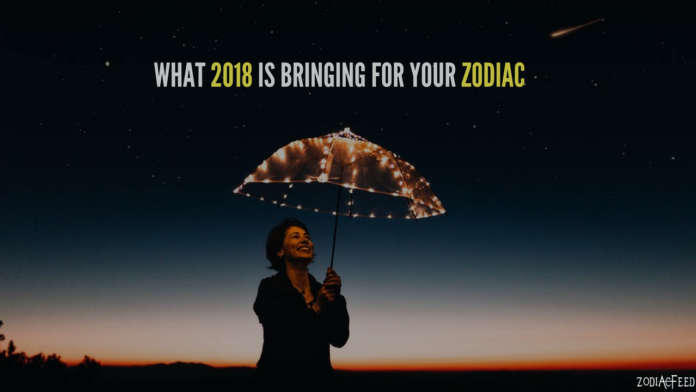 This year is a very prosperous and auspicious year for all those who are planning a new project or those planning to make changes in their lifestyle as well. Financially the year looks promising. You will be appreciated for all the good work you have been doing both at home and at work front. Those in the field of counseling might expand their work and for those in the entertainment field, the year looks exceptionally bright. Your Success Mantra For 2018: When you know luck is on your side it is always good to set plans into motion. 2018 is one such year. Don’t miss out. This year those who are still single can expect a new person to enter their life. They will make for their romantic partner and a long-term one. For many of the Librans, there is a high probability of meeting a person who makes for a very successful business partner to them. Remember to forgive if someone close to you hurts you, it is surely unintentional and unthought. Be kind and forget. Also, the most important thing to remember for you all this year is that at times what appears to be a problem is a prayer answered in disguise. The changes that happen in your life this year are only for better. Your Success Mantra For 2018: Do not resist the change. Welcome it with open arms. There is something great beyond your human eye can see, so embrace the new. This year is all about fairness and justice for you and those connected to you. Heaven has in store for you a beautiful plan. Your worries will fade away as the time passes and you shall start seeing the winds blowing in your favour. Legal matter if any will settle in your favour . Those looking for a particular job can keep high hopes. Financial windfalls are also expected. If a repetitive thought or a dream come again and again, take notice, please. It might be an answer to your prayers. Some of you might find yourself in a higher connection with the divine. Your Success Mantra For 2018: As this year is all about fairness and justice for you, make sure you practice the same with those around you. Be fair and just in your dealings. This year brings you a lot of new opportunities that you have been waiting for quite some time now. While some will be basking in this glory smart ones out of you will make the most of these opportunities coming your way. There might be some new things coming your way and that includes a new relationship to new responsibilities. Gear up for some newness in this new year. You have all the reasons to be happy and excited. It will be a perfect year to release anything you are done with. It will be a year to fulfill and manifest your desires. Your Success Mantra For 2018: This year your manifestation power will be an extra song. Make A List, affirm what you want again and again and again and see it coming into existence. Also Read: Know Which Zodiac Signs Are Not Compatible With Sagittarius and Why? Your Success Mantra For 2018: Moderation is the key for you this year. Make sure to keep a moderate pace in everything you do. Don’t overdo things overeat your favorite food and go overboard. The year 2018 is the year where you are asked to take a ground and stand strong towards what you want. You need to make a rough sketch and then a final blueprint of your plans and then work hard towards its execution. All that is needed at your end is a sincere commitment that you will give your best short and immerse completely in the project. Also, allow yourself to enjoy each moment. For musicians and artists be very mindful of every note you play or each stroke of the paintbrush. Make sure you do not carry any kind of negativity in your thoughts for anyone. It won’t tell them, but definitely on you. Your Success Mantra For 2018: This year your confidence will be your lucky mascot. Sometimes confidence in life gets you, where knowledge can’t. Be wise enough to flaunt your confidence at the right time. The coming year promises you a better time and a smooth road ahead. After a long bumpy ride now is your time to enjoy the drive. Life will be smoother this year with good moments, fine wine, rich music and your loved ones around. Travel is on the cards. You will be making memories traveling around the world and these trips are going to benefit you in your professional life as well. Your status in the society gets enriched, pay scales get a hike and lifestyle get a high. Some extra devotion and care are needed for health to enjoy all that is coming your way. So make sure you take good care of yourself. Prioritise your health over everything else and you will never regret doing it. Your Success Mantra For 2018: Head on your shoulder and feet on the ground. Yes, the more you stay grounded the more the success. Vanity kills the very essence of it. Previous articleHow Successful Can Your Zodiac Sign Be At Work?